At The Architect’s Newspaper, we are busy getting ready for the upcoming Facades+ conference in Los Angeles taking place October 19th and 20th at the LA Hotel Downtown. The conference will bring together a wide collection of L.A.-based designers and practices ready to share their knowledge and expertise. Below, we bring you some highlights from AN’s recent coverage of some of our featured speakers! 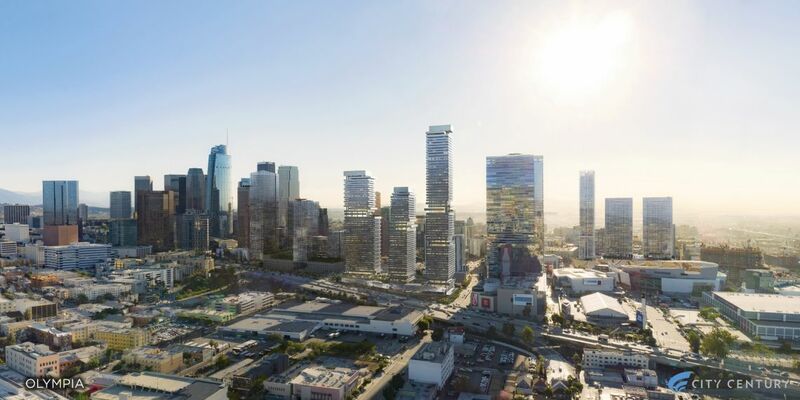 SOM, along with Los Angeles-based P-A-T-T-E-R-N-S and developer City Century, unveiled plans earlier this year for a three-tower complex named Olympia slated for a 3.25-acre site in Downtown Los Angeles. The mega-project plans to include 1,367 residential units, 40,000 square feet of retail space, and 115,000 square feet of open space, with the towers climbing to 43, 53, and 65 stories in height. Paul Danna and José Luis Palacios, Design Directors at SOM Los Angeles and Garth Ramsey, Senior Technical Designer, have been our partners in organizing upcoming Facades+ in Los Angeles. They will appear onstage with Keith Boswell—SOM’s Technical Partner—and Mark Kersey—from Clark Construction—to speak about the new Los Angeles Federal Courthouse. Architects John Friedman Alice Kimm (JFAK) recently completed work on the La Kretz Innovation Campus in Downtown Los Angeles. The 61,000-square-foot “sustainability factory” will act as a green tech-focused start-up incubator space that also collects rainwater to feed an onsite public park and is powered by sunlight. The complex is designed to facilitate daylight penetration into interior spaces and features public gathering areas and a robot fabrication lab. Alice Kimm, co-founder at JFAK will be giving an afternoon presentation at Facades+. 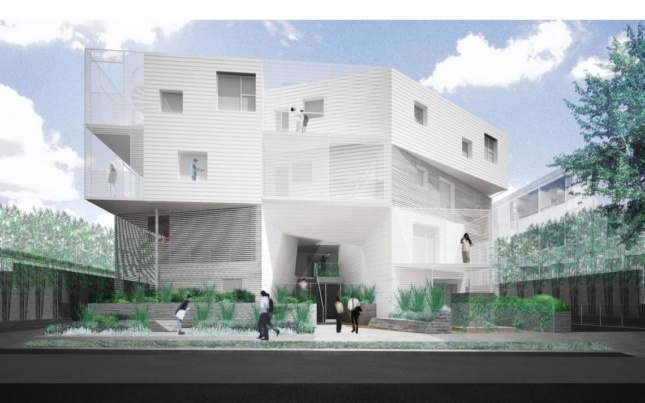 A new four-story apartment complex designed by Lorcan O’Herlihy Architects (LOHA) is currently under construction at 1030 N. Kings Road in West Hollywood, California. The 30-unit condominium complex will feature cantilevered corners, faceted facades, and perforated metal panel and wood cladding as well as partial courtyards that will bring light and air into each unit and the building’s circulation spaces and common areas. The cut-outs will also hold balconies for the units. Lorcan O’Herlihy, founder of LOHA, will be giving a morning presentation at Facades+. KEA has wrapped a recently-completed addition to the Temple Israel of Hollywood in a large-scale folded aluminum shroud. Koning Eizenberg Architects (KEA) recently completed work on the new Temple Israel of Hollywood complex in L.A., a new addition to the 91-year-old Spanish Colonial style synagogue. The new wing carves out a communal courtyard for the complex that is wrapped on one side by a folded aluminum shroud. 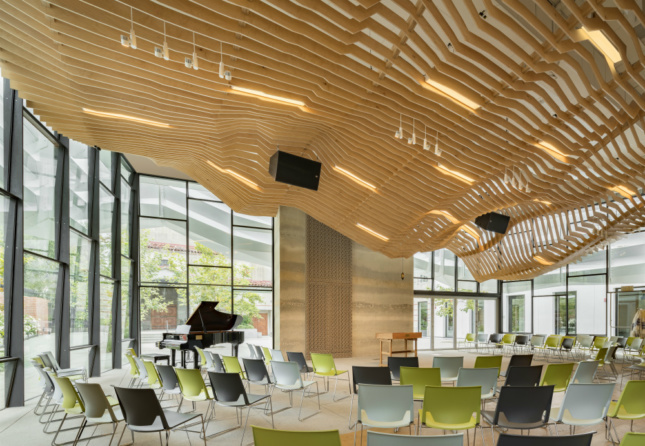 The addition’s main interior gathering space features a drop-down ceiling made from CNC-milled maple wood as well. Both co-founder Julie Eizenberg and principal Nathan Bishop of KEA will be delivering a keynote address at the conference. Visit the Facades+ website to learn more and sign up for the conference.